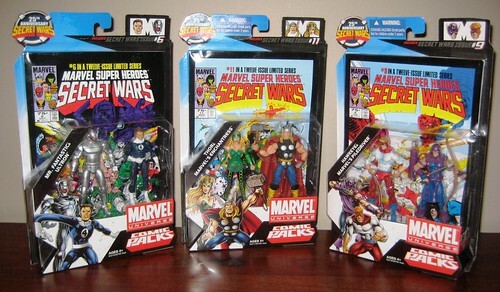 While I have no particular love for what Hasbro is doing with the Marvel License, the idea of a line dedicated to the original Secret Wars miniseries is something I have a great deal of time for. There is a nod to collectors in these two-packs, as there's no current property to fuel sales, and there are some fairly C-List characters in the mix. While we've had the repeat characters that feature in the Marvel Universe world, they've come in a satisfying '80s style, four colour look that reflects the art of the miniseries very adequately. The disappointment with this line has been the sporadic quality control, and this frustration is extremely evident in the third wave of three two-packs, which contain both the absolute best and absolute worst of what Hasbro's 3 3/4" Marvel figures have had to offer so far. 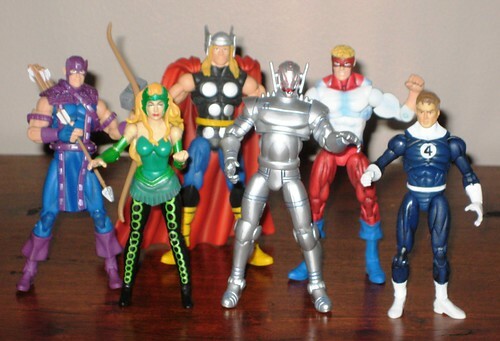 Wave Three includes Mr Fantastic & Ultron, Hawkeye & Piledriver and Thor & Enchantress. There's very little "Fantastic" about poor Reed Richards, or should we say his teenage nephew Nigel, who just happened to be wearing Uncle Reed's uniform on the day he was called to model for this figure. To make matters worse, it looks like Ben Grimm sat on the poor tacker's head, so the end result here leaves alot to be desired. Scale fail in the extreme, and a squashed head to match. Fail to the max. On the flipside, Ultron is awesome, despite a left shoulder pad (well, prong.... metal thing....) that keeps popping off, this is a great figure. The advantage here is that there's no facial features to juggle with of course, but apart from that the detailing and sculpting still put this a step above the rest. It's a win that *almost* negates the Mr. Not-Fantastic debacle. Hawkeye is extremely well done, and certainly the best accessorised of all of these figures so far. He has a smirk on his face, but from the photos on the packaging it at least looks like that was intended. His uniform is very detailed and his gear is (bow, quiver, arrow) is great. A big winner. Piledriver is another great addition to the Wrecking Crew (although I'm a bit concerned we haven't had news of Wrecker himself yet...), but I really hate the blue wash over the white in his uniform, especially since one of the thing I've liked about this line is the plain colouring reminiscent of the style of the comics at the time. Thor and Enchantress are quite good figures, in fact Enchantress could have been the best yet of the MU females (limited though they are), if not for the wonky paintwork on her eyes. Instead of the Asgardian beauty she should be, she ends up looking more like your cross-eyed cousin Ethel with the unfortunate facial hair problem that is only allowed out for family weddings. If I was a customiser I'd be doing an eye repaint quick smart. Thor is well done, and I love the plain colours and 80's styling here. Again the face it a bit of a letdown, but this is still a nice addition to the line, and a good template for the Modern Age version that's coming up in Marvel Universe. Overall, I'm happy to have these in my collection, but it's hard not to look at them and think of what could have been with a little more QC. You can see more pics at Facebook, discuss this on the AFB Forum, and comment on this post to enter the AFB February Comment of the Month Contest. Mine are in transit, and won't be opened until I get some space free, but they do look quite nice. I agree that QC has been lacking, if these had looked like what was displayed at the SDCC last year, they'd be fantastic. And so far, I think the Ms Marvels have been the best Females in this line. Good Job on character selection, but most of these I'm not impressed by. Oh they announced Wrecker for the normal wave 4 this year at toyfare. Somehow these figures aren't quite making it for me. "Nigel Richards"....heh, that's funny. These are horrible. Glad I abandoned ship. My 6" Wrecking Crew just confirm it. LoL Hasbro can get a separate arrow in a smaller figure line and Mattel can't? 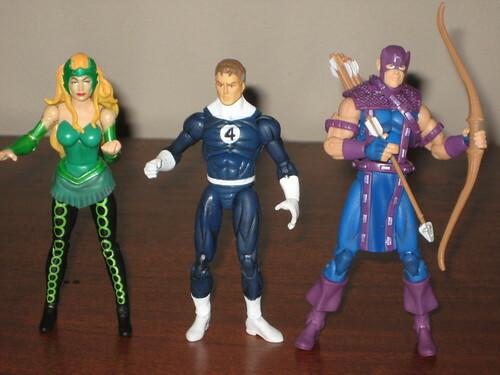 Hawkeye does look pretty awesome, shame about enchantress and reed. Saw these at a TRU (I think) this past weekend. Still not buying them, but I was impressed by classic Ultron and Piledriver. Didn't care for Thor or Enchantress. The heads seemed really bad. Of course, I only looked at the first ones on the pegs. Some other packs might have looked better.